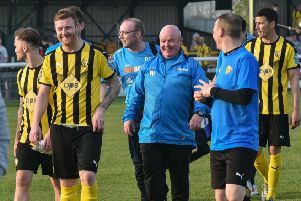 Leamington enjoyed a useful workout on a rare visit to the home of Midland League Premier Division side Highgate United, writes Paul Edwards. Lee Moore had a shot deflected through to the goalkeeper in the early stages but Brakes almost found themselves behind in the 14th minute when James Mace was adjudged to have fouled Lei Brown in the area. Aaron Brown stepped up to take the penalty, firing the ball down the middle but Tony Breeden, making his first appearance of pre-season, made a fine save with his legs. Brown made amends for his penalty miss by putting the hosts in front with his next opportunity just past the half-hour mark, going through on goal and shooting low past Breeden despite the keeper getting a strong hand to the ball. Leamington were level within a few minutes, however, Ahmed Obeng swivelling to stab a low shot across goal that appeared to deceive the Highgate keeper as it found the far corner after Moore had capitalised on defensive hesitancy. New signing Darren Pond curled a good effort in that was held by the goalkeeper as the two sides ended the first half level. That quickly changed within moments of the restart, Rob Thompson-Brown slotting home at the far post after a neat overlap down the left between Moore and Connor Gudger. Almost immediately, an acrobatic effort from Moore was well saved, with the follow up from Obeng being blocked by a defender. Leamington were unlucky not to have a third goal when Obeng’s pace got him clear on the right and a sweeping ball found Thompson-Brown on the far side. He still had work to do but beat his man and touched the ball back to substitute Courtney Baker-Richardson, who had an empty net to aim for as the keeper came off his line. However, his shot struck the legs of Thompson-Brown, who was doing his best to jump out of the way. Moore had another effort saved and substitute Tom James watched an ambitious effort from way out drop past the post. The Leamington fans felt their side should have been awarded a penalty when Baker-Richardson was bought down by a combination of two defenders in the box. The referee was not interested, however. Highgate went close twice late on, with Simon Fitter’s well-struck free-kick held by Breeden after former Brake Josh Hawker was bought down on a surge towards the penalty area, while a fine dipping effort from Declan Attenborough bought an equally good one-handed save from Breeden. Baker-Richardson bought an end to proceedings with the final touch of the game, thumping home a header from James’ corner. Brakes: Tony Breeden, Ben George (Ross Oulton, 60), Connor Gudger, Jack Edwards, Rob Elvins, James Mace, Lee Moore (Tom James, 60), Darren Pond, Ryan Rowe (Courtney Baker-Richardson, 46), Ahmed Obeng (Ryan Rowe, 70), Rob Thompson-Brown (Ahmed Obeng, 85). Sub not used: Richard Taundry.